Stay mosquito free with Thermacell Olive Appliance. 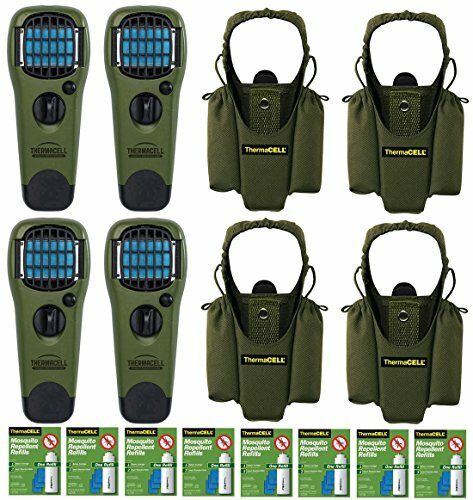 Thermacell offers odorless protection from mosquitoes. It gives off no scent that spooks animals, making it ideal for outdoor activities such as hunting, fishing, camping, barbecues, backyards, decks and many other outdoor activities. Thermacell Mosquito Repellent works to protect you from bugs by using the repellent, allethrin. Allethrin is a synthetic analog (chemical copy) of a naturally occurring insecticide, pyrethrin, found in the pyrethrum flower of the Chrysanthemum family. Refills can be stored for long periods of time and do not have to be used all at once. When done using, turn the unit off and restart when ready. It should be stored in a dry, dark place if time between uses is more than a week. The Thermacell Oliver repellent holster allows you to carry your Thermacell mosquito repellent device when you're camping and hiking or exploring the outdoors. This holster features storage space for butane cartridges and repellent mats (not included), and it can be attached to a belt, backpack or even a tree stand. The design of the holster also allows butane cartridges or repellent mats to be changed without removing the device. This special offer includes four Olive Green Repeller Devices - buy four and save. Each device provides up to 12 hours of 15-foot x 15-foot protective barrier against mosquitoes, black flies and other biting pests. Buy two to protect a larger area, or for four people, or for longer operation time. Also includes four Holsters. "no-hands" way to transport and secure ThermaCELL Appliances and Refills. Holsters can be clipped to your belt, tent, gear pack, a tree stand, etc. Lightweight, portable and no-flame option for effective mosquito control. Comes with a 1-year limited warranty against manufacturer defects. Each refill cartridge lasts up to 12 hours, and each mat lasts up to 4 hours. The refill packs in this offer include a total of 24 mats and 8 cartridges. Thermacell devices are not recommended for use on the Moon, because there are no mosquitoes on the Moon. Please do not bring mosquitoes to the Moon.